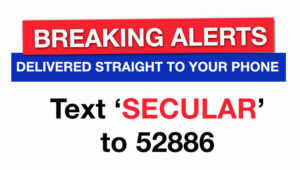 If you live near Washington, D.C. or have the ability to travel there, consider registering for the Secular Coalition for America’s upcoming Lobby Day and Secular Values Summit on April 24-25. It’s a chance to speaking with your elected officials about matters involving church/state separation — you sign up and the SCA staff will set up the meetings — as well as an opportunity to hear speeches from legislators, journalists, and activists who will inspire you. I’ve done it before and it was a memorable experience. It’s amazing how simple yet vital it is to make sure your voice is heard by members of Congress. This year, the plan is for participants to focus on two issues in particular when speaking to their representatives: The Do No Harm Act (which they support) and the purposely misnamed First Amendment Defense Act (which they oppose). They’re lobbying for a secular vision of our country. And if that’s not incentive enough, the list of people receiving awards the night before Lobby Day includes a lot of names that ought to be familiar to regular readers.